Chosen by Writer’s Digest magazine as one of the best new self-published books of 2005, ‘Buddha in the Boardroom’ is a clever and entertaining blend of business challenges and Buddhist philosophy. Learn the secrets of the original self-help Guru. Over 2,500 years ago The Buddha shared with his followers what Western medicine has realized less than 200 years ago: emotional suffering can be just as painful and debilitating as physical suffering. Buddhism teaches us that if we learn to handle our relationships properly our life will be easier. Learn how your chaotic and stressful workplace environment is really a series of relationships, whether it is with your boss, co-workers, customers, salesmen, competition, or suppliers. Each chapter shows how by learning to handle these workplace relationships properly, you not only increase your chances of success, but your job can actually become less stressful and more enjoyable. 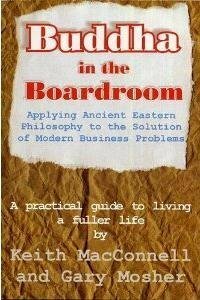 Sometimes funny and now and again serious, discover for yourself why ‘Buddha in the Boardroom’ has been called ‘the business book that is inspirational.’ Chapters include: competition, conflicts, controlling anger, risk taking, ethics, handling change, teamwork, goal setting, time management and many more in 30 chapters and 138 pages. Buddhism is universally accepted because it is not in conflict with any religion nor with science. See for yourself why Buddhism is not for everyone; it’s only for those who want to live a happier and more productive life.